While on my 2 week job training in Little Rock, I had the unbelievable opportunity to take a trip “home” to the Big D– Dallas, TX! !Â I’ve been dying to get back so it was a win win: save the company some money on my expenses and see some of my most favorite people in the world! Having lived in Dallas from 2001-2003,Â the Lone Star State has a hold on my heart! I swear, my TX friends are my family; the peeps I’ll be sitting with on rocking chairs,Â sipping on bloody marys and mimosas…. when we are 80 years old.Â At this point I am the only one of our “group” that does not have a husband or children so you can only imagine how much fun we all have when Carlyn comes to town! Hard to believe it’s been 4.5 years! When she first contacted me about the room, I was simply excited about the idea of helping bring a native Bostonian, aka another New England Fan, across the frontier and into my pad! I know what it means to trade in the Atlantic for the Pacific and thought everyone should know that feeling, too.Â However, once she realized I was leaving for OZ, she was more excited to give me pointers for my journey! And so, the pen pal-ing began. As she wrestled with the decision of moving to SD, she helped me prepare for my own adventure. In the end, she got a fabulous job with Anheuser -Busch as a Marketing Rep an decided to stay in Boston… and on Feb 27, 2005, I hopped on a plane (without my wallet, but that is another story in itself) and headed to hang with the Aussies! After 3 months in the land down under, that took me from Sydney to Adelaide to Melbourne to Hobart,Â followed by an unforgettableÂ trek to Bali, Indonesia, I returned back to San Diego…slowly realizing I was not ready to be in one place.Â I was still restless. I didn’t want to settle on a job, I simply was not ready. Seeing that I was sofa surfing on what was now my Brother’s Place, I was far from being stable. I put everything I had into the universe to guide me towards my next step on the ladder of life. I was ready to move forward and I was open to ideas! Then I met Laura Sechrist… as it turned out, the friend I was obviously praying to pop into my path!Â LONG story short, it ALL comes together. The job. They passion behind the job. The traveling. And… the pay!!! I was now the PR Manager for the Volkswagen of America mobile marketing “Force of Good” Tour, launching the 2006 VW Beetle. I was going to travel the country “spreading goodness” along the way– a $15,000 budget per city to make people smile! It was a DREAM JOB and had my name written all over it. Not to mention I was gonna cruise around in a red, 5-speed convertible bug with white hearts wrapped around the entire vehicle. So, to plan the tour, I was being flown out to Arnold Worldwide to live in a snazzy hotel, the Lenox Hotel, for 6 weeks in the Back Bay…. no, not San Fran… but Boston! Who did I immediately email: Thea. One of the best parts about meeting a stranger you know is going to be a friend… well, is just that!!! When you have been getting to know someone long enough that are certain you will hit it off, because you have already helped each other get to the point of where you are that day. I never thought twice about meeting someone that I only knew through the internet. I didn’t find it strange at all that we met on Craigslist.Â And literally “felt” that we were meant to be friends. And… I had the exact same feeling when she and I met at a bar for a few drinks… and laughs! It was as if it all came full circle.Â As it turned out,Â we had a blast putting a face with an email address, but she and I never saw each other again.Â I went on to travel cross country with my tour and she went on to travel cross country on a mobile marketing tour, too! So, after our tours, we both started “real” jobs and our pen-palling came to a halt. I can’t remember who found who first but I can remember giggling with glee as I realized we had both gone on to lead incredibly colorful lives. AND, of all places, Thea was now living in DALLAS!!! How in the world did she get to TX?Â Had we really swapped places again??? So, when I got an email message from her asking for my phone number so she could ask me about my trip to Peru since she had seem my photo album and was planning her own South American Tour, I jumped at the chance to catch up! Plus, how cool to be able to repay the favor and give her MY travel tips all whileÂ talking the talk about what was now my old stomping grounds!! !Â For whatever reason, we both played phone tag but we never had that “long phone call”. But, I never deleted her number. You know those times you scroll through your phone getting rid of the random names of people you met and forgot to put in their “code name” so now you have no clue who they are… yup, she survived all those sweeps!!! I can look back now and know I didnt delete her number because deep down I really wanted to talk to her again. I sent her a text from Little Rock to see if she would be in town. She, on the other hand, didn’t have my number saved in her phone!! So, when she responded that she was in LA but would be back in town on Sat (What– now she was in Cali??? )…Thea actually thought she was talking to her friend from Dallas that travels all the time! You can imagine her surprise when she realized it was me. Luckily, I was so excited with the idea of hanging out after all these years that I called her and left a voice mail.Â Mystery solved on her end!!!! Soon after landing in Dallas that Saturday afternoon, she called.Â Hearing her voice felt like talking to an old friend– only reality, we had only met once. Making plans with her and talking about what we were wearing that night felt normal– only we had never done that before. And, introducing her to my Dallas crew after dinner when she came and met us for drinks… was the icing on the cake. Not only were the reactions from my friends priceless as I shared the story of how she and I knew each other, but she then turned her own strangers into friends… out of MY friends!!!! I think what is neat to note is the role Thea plays now in my life… one that I could never have predicted during our travel banter back in 2005.Â Thea and I are a lot alike. We met at the age of 25, swapping Passport Stamp stories… and years later, we are still the same spirited gals. To have someone like her in my life NOW means even more than it did back in the day. As we get older, life happens. Some get married. Some go to the Peace Corps. So have three kids. Some are unsure where they want to be a year from now. Thea and I sat at the bar, sipping on Dirty Vodka Martinis and talked about LIFE for almost 2 hours the night we reconnected– and THAT talk, meant the world to me. We have much more to share with each other now than we did at 25. Like I say, timing is everything and people come in and out of life for a reason. Here was another perfect example!!! But. The fun didn’t end there. 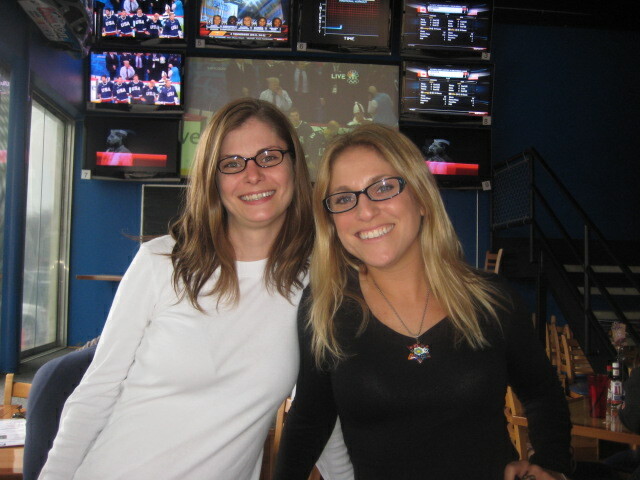 Our adventure carried into the next day when Jennifer Tokash and IÂ (another Stranger To Friend- the best gal pal of my ex boyfriendÂ from Fort Worth that now lives in New York City) met Thea and her friends to watch the USA vs Canada Hockey game. JT (as I call her) and I had sworn to each other we would “meet in the middle” but we never expected to both be in Dallas at the same time!Â Our plan was Jazz Fest in New Orleans! We LOVE our live music. JT is also the one friend that came to visit with me in Boston during the same work VW period I met Thea. It is as if we were ALL meant to meet. Me & JT– meeting in the middle! What I loved most about the fact that JT, Thea and I were watching the Going for the Gold game together… was the simple fact that we were 3 unlikely partners in crime… but yet 3 true hockey fans! I couldn’t imagine a better dream team for the occasion! From Cali to NYC we ALL met in the middle… in Dallas, to watch a once in a lifetime game… on a spontaneous weekend I went to Dallas, JT came to visit her new born nephew and Thea finally came home from work. Hi. I love the site. I am, once again, very impressed with you. This is is such a noble cause. I have a feeling big things are coming your way Carlyn.